This former prison island in the Bay of San Francisco, USA, is one of the world's premier (and most popular) dark-tourism attractions. Possibly the most legendary ex-prison in history, the site is now managed by the National Park Service and as such is open to the public – who come here in droves, which means that at least in summer you have to pre-book tickets well in advance. Despite the throngs, however, it is worth it. There is a lot to see and learn here – and the whole aura of the place is indeed exceptional (even despite its popularity). More background info: Alcatraz, also known as “The Rock”, is a small rocky island in the middle of San Francisco Bay. The name means 'pelican' in old Spanish, and indeed it has long been home to a plethora of seabirds, even though pelicans are these days not known to nest on the island any longer. When California became part of the USA in the mid-19th century, the military began fortifying the island, which had a key strategic location guarding the entrance to the Bay, i.e. the Golden Gate. For the same reason, the first lighthouse on the Pacific coast of the US was also erected on the island. Fortress Alcatraz, or Citadel Alcatraz, together with Fort Point (today underneath the southern end of the Golden Gate Bridge), became an integral part of the line of defence to protect the port of San Francisco during the Great Gold Rush and the Civil War – though it never actually saw any action in battle. Advances in military technology, however, rendered the defensive role of Alcatraz more or less obsolete by the end of the 19th century. Yet, the island had already found another role: that of a dungeon. From its earliest days, the Citadel of Alcatraz also served as a place to house prisoners. After Alcatraz was decommissioned as a military garrison in 1907, it formally became a military prison in 1915. The old fortifications were largely torn down and a new concrete cell block was constructed. With this also came a change of name. The facility was now officially called “United States Disciplinary Barracks, Pacific Branch”. Soon it would house scores of conscientious objectors during World War One in addition to its regular inmates. In 1933/34 the prison was transferred to the Department of Justice and was turned into a maximum security federal penitentiary. This was the beginning of the era during which Alcatraz would acquire its legendary status. Much of that legend is more myth than fact, though. The prison was never overcrowded (in fact it was never filled to capacity), there were never any executions on the island, and it was run properly, provided decent food, it was clean, and all that – yet it was still a maximum security facility, and as such it was shrouded in secrecy. No members of the public were allowed to visit the island itself, but its visibility from the waterfront of San Francisco made it an object of curiosity. Viewpoints with powerful telescopes set up on the shoreline became an early form of Alcatraz-related dark tourism in San Francisco (long before this term was invented). Even though Alcatraz is legendary as having housed the USA's most notorious and dangerous criminals, there were in fact only relatively few inmates who really fit that designation. However, this included some of the best-known names in that category. First and foremost amongst these was Al “Scarface” Capone – arguably the most (in)famous gangster in history, who served nearly 5 years of his prison term in Alcatraz in its earliest days (until 1939), mostly in the prison's hospital. Other “big” names amongst the inmates at Alcatraz were “Machine Gun Kelly”, another prohibition-era gangster, Alvin “Creepy” Karpis, also a gangster and the prisoner doing time longer than anybody else at Alcatraz (26 years), and Robert Stroud, the “Birdman of Alcatraz”. The latter was also the title of a 1962 Hollywood movie starring Burt Lancaster, one of the best-known films featuring the prison island and cementing its legendary status. In actual fact, Stroud was not permitted to keep birds on Alcatraz – though he did in the prison he was doing time in before being transferred to the island. Also legendary are the escape attempts from Alcatraz. Again, this featured prominently in the movies, especially in the 1979 thriller straightforwardly named “Escape from Alcatraz”, starring Clint Eastwood. The film picks up a true story of possibly the most dramatic escape attempt from Alcatraz ever, which took place in 1962. This was probably also the one that came closest to succeeding. Three prisoners managed to chisel their way out of their cells and through an unused utility corridor they made it to the coast where they attempted to cross the icy waters using improvised rafts. They were never seen again. It is thus assumed that they probably drowned trying to make their way across the Bay, though their bodies were never found. So it could, theoretically, have been the only successful escape, but it is unlikely. In total there were 13 more escape attempts, and none succeeded. The most violent attempt resulted in the Battle of Alcatraz that took place in 1946. Two prison guards were killed after a group of prisoners managed to steal weapons from the prison's gun gallery and took hostages after they failed to obtain the guard's key they had been after (he hid it, thus thwarting the potential escapees' plans, but he paid with his life). The Marines were eventually called in to break the stand-off and the three main hostage-taking prisoners were eventually killed. Two surviving accomplices were later executed for their role in the rebellion. The penitentiary was eventually closed in 1963 (by US Attorney General Robert Kennedy), mainly due to its high running and maintenance costs. The last prisoners were transferred to other correctional facilities and the island was left more or less deserted. In November 1969 a group of Native American activists under the name “Indians of All Tribes” occupied the island and for the next year and a half made a highly publicized case for Native American issues. Though it found a very supportive echo in the mass media and definitely helped the advancement of the political and cultural recognition of Native American rights, the occupation ended unglamorously. The numbers of Indians holding out on the island had already dwindled massively, due to the difficulties in supplying it with food and drinking water, and in June 1971, federal agents forcibly removed the last group of occupiers. In 1972, Alcatraz island was incorporated into the newly formed Golden Gate National Recreation Area and has since been administered by the National Park Service who opened it to visitors from the general public. Alcatraz has become one of San Francisco's premier tourist attractions. Numbers of visitors have become so large (ca. 1.5 million annually) that a strict ticketing regime (see under access & costs below) and crowd management measures are in place. What there is to see: After you've checked in at the ticket booth by the pier that the ferries to the island depart from, you have to wait in line before being allowed to board, in batches. After the crossing the ferry docks at Alcatraz and the crowds spill out into the forecourt by the Park Ranger's Office. Here you can listen to an introductory talk by a ranger … or already make your way to other parts of the island. Furthermore, while at the dock and ranger station you can pick up a brochure/map of Alcatraz island (1 USD), which is useful for orientation. At the Park Ranger's Office you can also find listed the various extra free programmes scheduled for the day (e.g. talks on topics such as military history or the Indian occupation). Most people head straight to the cell blocks, so in order to get away from the worst of the crowds I decided to stay behind and see the historical exhibitions in the old barracks and guardhouse buildings first. These exhibitions should not be missed! They tell the whole history of Alcatraz, including the military phase, i.e. its pre-prison era, the legendary myths that formed about the prison, the reality of prison life, and also covers its post-penitentiary days. Especially revealing is the coverage of the Indian occupation from 1969 to 1971. It forms a special separate exhibition called “We Are Still Here” and includes a series of four captivating video documentaries screened in a loop in one of the rooms. There is also a larger cinema hall in the barracks basement in which a general introductory film about Alcatraz is shown at regular intervals (and in a range of languages). Outside a solitary watchtower dominates the square. It is the last one still standing out of formerly a whole set of such towers. But you cannot climb it. After passing through the guardhouse you come to the ruins of what used to be the Post Exchange during the military phase of Alcatraz and later the Officers' Club. It is in ruins because it was one of the buildings destroyed by fires that broke out during the American Indian occupation of the island. 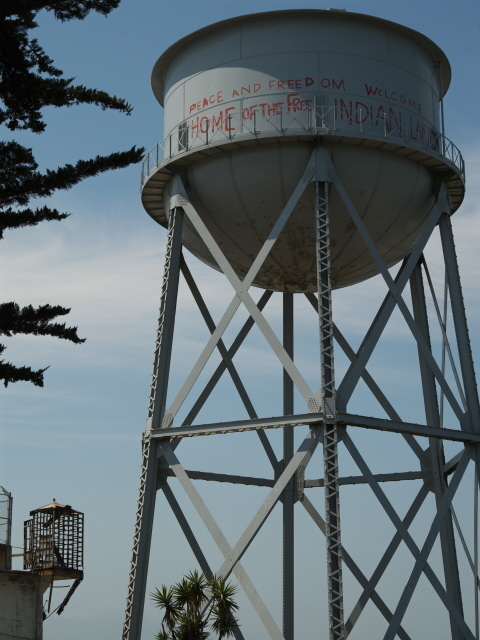 The water tower to the left, a bit further up the rocky hill, also has a remnant of the occupation in the form of graffiti proclaiming “peace and freedom”, “welcome” and “home of the free Indian land”. At the crossroads by the Officers' Club ruins you can decide whether to continue up the winding path to the Cellhouse or whether to explore the other parts of the island further along to its north-western end. Let's come back to these other parts later. Certainly the core part of any visit to Alcatraz is the Cellhouse. The visit is normally by audio tour. If you do not want to take the audio tour you can apparently get a refund from the desk where they hand out the machines (but not from the ticket office!). I decided to go with the audio-tour offer, though I am not a big fan of such devices, because they regiment the visit so, as to when to see what and for how long and all that. In this case, though, I appreciated the extra info and details pointed out during the tour which I would otherwise certainly have missed out on. The audio is a bit slow moving at times but overall quite good. They certainly made an effort trying to make it lively and engaging. I often had to pause the audio, though, because of the crowds – and here you really cannot get away from them. This sometimes means you have to wait until a group moves on before you can continue to play the part of the audio narration pertaining to that location on the tour. I thus took quite a bit longer to finish the audio tour than the nominal 45 minutes' running time of the audio tracks as such. And what does the tour include? You obviously get to see plenty of old prison cells, which come in a range of types, including a small set of windowless isolation cells. Some cells are bare, other have been decked out in a way that they may have looked like when occupied by prisoners. Some even have dummy prisoners lying in their beds. During the tour you get told stories of particular prisoners, or of the high-profile escape attempts. The so-called “Battle of Alcatraz” (see above) receives particularly detailed coverage on the tour and includes the spot where the floor is still scarred from exploded shells. At times a park ranger gives a demonstration of the cell door opening and closing mechanism through a complicated set of levers by which any particular number of cell doors to be operated could be pre-set. These demonstrations, involving a lot of clanking metal, are especially popular. I found it hard to find a spot from where to get a good view (through a sea of heads and smartphones on selfie sticks). 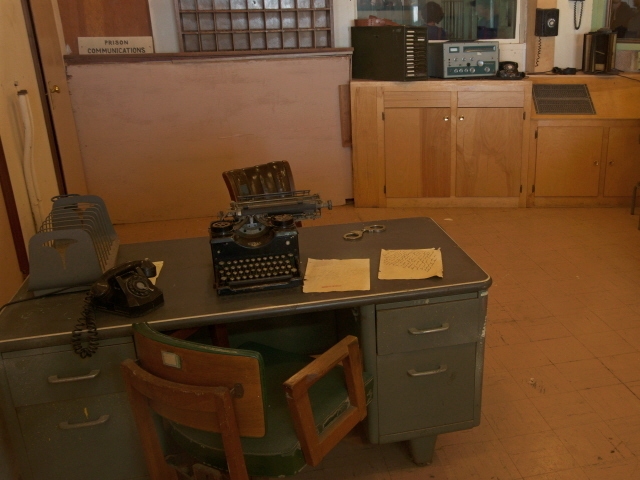 The tour includes the kitchen and dining hall part as well, and some of the administrative block too, with prison warden desks and electronic communication installations. On display here is also a model of Alcatraz island as it would have looked ca. 1940. You can step outside the courtyard by the lighthouse (a 1909 concrete replacement of the original first one) and enjoy marvellous views of the San Francisco skyline. To the left is another ruin of a building that burned down during the American Indian occupation, in this case it is the former Warden's House. Parked outside is a veteran Chevrolet pick-up truck from the 1930s or 40s. Looking down onto the former parade ground you notice some heaps of rubble – these are what is left of a set of buildings that used to be prison staff families' homes. They were demolished after the Indian occupation and before the island was turned into a National Park. A couple of information panels provide basic information about these parts and also about the Indian occupation. You can see another vestige of that occupation in the coat of arms above the admin building's entrance: the stripes in the stars-and-stripes flag part underneath the eagle's talons have been altered to form the word “free”. But it is quite faded by now so it is not that easy to make out. On the other side of the Cellhouse, near the dining hall and “times square” (where a clock facing the cells told inmates the time of day), another doorway provides access to the former exercise or recreation yard. Here, inmates were allowed some degree of breaking the monotony of day-to-day prison life by playing baseball or running or just sitting outside in the open air and staring out towards the land of the free on the mainland. Not everybody left the island alive, though. No executions ever took place at Alcatraz, but not only did a few prisoners and guards get killed in violent clashes such as the 1946 Battle of Alcatraz (see above), inmates also died of natural causes during their prison terms. 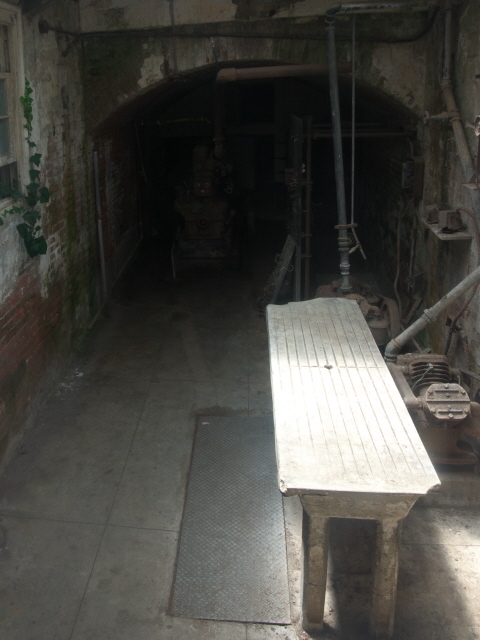 A morgue was built during the island's time as a military prison. And you can peek into this small building and spot the table on which corpses would have been placed. This is, however, a reconstruction because the morgue building was no longer needed during the penitentiary era (when ferries provided fast and regular transport to the mainland), so it was reused to house an additional generator. Coming back down the approach path from the Cellhouse you can see some of the gardens that were first planted during the military period and kept up by the prison staff families. Pretty flowers on an otherwise grey and barren prison island! What remains of the families' housing was undergoing refurbishment work at the time of my visit to Alcatraz (summer 2015) but these may have been made accessible too by the time you read this. Also closed off to the public was the former parade ground beyond – as this was at the time protected land for the island's large sea-bird colonies whose nesting season it was then. At other times you may be able to explore these parts and see more of the nature side of Alcatraz. At the other, north-western end of the island, yet more parts were accessible also at the time I was there. The semi-ruined buildings of the former Storehouse, power station and Model Industries Building were still out of bounds, but the New Industries Building could be entered. It provides space for temporary additional exhibitions. At the time I was there this was an extraordinarily interesting exhibition about ageing prisoners in the USA. Some of the individual stories were extremely touching. It certainly shed light upon some not often considered dark aspects of the American penal system. Speaking of which: the way this system is portrayed, also in the main cell block building, is by no means especially glorifying, nor exploitative or overly dramatized. It even included a section that was surprisingly outspoken about the unsavoury angles of this topic, such as the disproportionally high prison population in the USA compared to the rest of the world, or the fact that privatization of the running of prisons (i.e. as profitable businesses) has gone hand in hand with a sharp increase in the overall prison population over the past few decades. Also shown in the statistics is the fact that well over half of all people locked up in the USA are imprisoned for either drug offences or immigration, i.e. for effectively “victimless crimes”. I had read about criticisms of the commodification at Alcatraz as a “disneyfication” of the topic of prisons and prisoners. I cannot confirm this in the slightest, on the contrary. I found the interpretation and narrative totally objective and factual throughout. And very educational in many different ways. I think the management of the site is actually very commendable overall, also including the handling of the huge numbers of visitors it attracts. The latter, however, may be an aspect that might deter some people from visiting Alcatraz. It is true that the crowds can be a negative distraction. But it turned out to be not as bad as I had feared. And you can avoid the worst of the crowds by going on the very first tours in the morning, before the throngs on the island swell up (see under access below). Finally it should be mentioned that Alcatraz naturally also comes with the usual commercialization in the form of a big museum shop. Souvenirs are also available for purchase aboard the ferry boat as well as at the dock on Fisherman's Wharf. I didn't check these out systematically myself but I've been advised that the better deals are to be had in the shop on the actual island itself. All in all I found that my visit to Alcatraz more than lived up to the expectations I had – in quite a few ways it exceeded them significantly. Absolutely most highly recommended! NOTE that the above account is that of a regular stand-alone day-tour visit. There are also combination tickets as well as so-called night tours, which run in the late afternoon when the regular tours have finished and are fully guided. These latter tours include a few extras such as a narration aboard the ferry as it circumnavigates the whole island, and also access to some parts of the island normally closed to the public (such as the hospital) as well as special presentations. While these “more intimate and engaging” tours (to quote the website selling them) obviously add some intriguing extras, they also mean a few restrictions compared to the regular day tour. In particular, from what I can gather, you are not allowed to explore the island independently on these tours and you certainly won't have time to inspect the additional exhibitions in any depth (if even at all). Some parts of the island normally open during the day are closed in the evenings for safety reasons. In any case, do plan ahead! Tickets often sell out well in advance, sometimes more than a month ahead. So go online and secure your preferred time slot as soon as you can (see below for more details). Location: in the Bay just north of San Francisco, California, USA, a good mile (ca. 2 km) off shore and ca. 3 miles (5 km) east of the Golden Gate Bridge. Access and costs: naturally restricted, access by ferry only, tickets sold in advance online tend to run out weeks ahead; not at all cheap, but worth it. Details: Access to Alcatraz island is, unsurprisingly, by ferry only. These are run by a private company contracted for the service by the National Park: Alcatraz Cruises LLC. Their boats depart from Pier 33 near Fisherman's Wharf on San Francisco's northern waterfront. To get to Pier 33, it is recommended that you use public transport (there is no parking at the Pier itself, you'd have to use nearby parking facilities, which can be very expensive). The historic streetcar line F (operated by Muni) runs directly past the pier, and two of the famous cable car lines terminate at the other end of nearby Fisherman's Wharf (see under San Francisco >access). Tickets for Alcatraz should be booked in advance online or by telephone. In theory, tickets for the same day would also be available directly from the ticket booth on the pier. However, as tickets regularly sell out far in advance (weeks, sometimes months), you wouldn't want to take that risk. Tickets become available through the company's webshop from 90 days ahead of time. Make sure to secure your preferred time slot as soon after that point as you can. Prices: the regular day tour ticket, which includes the return journey by ferry, Cellhouse audio guide, national park fee, etc., comes to (at the time of writing in March 2016): 31 USD. The special “night tours” cost 38 USD. The latter is a partially guided tour and also includes the audio-guided tour of the Cellhouse plus a few extras that are only available on that tour. The audio guides for the Cellhouse part are available in a range of languages other than English too, including French, German, Italian, Japanese, Korean, Mandarin, Portuguese, Russian and Spanish. Times: the first tour of the day usually starts at 8:45 a.m. in the winter season, presumably earlier in summer – these are sold specially under the label “early-bird ticket” but cost the same and are identical in coverage to the regular day tickets (it's just that it's a way to avoid the worst of the crowds – so it might be a good idea to aim for one of these tickets). Throughout the day, ferries then depart between every half hour or 20 minutes. On the normal day tickets you are free to take any ferry back to the mainland, so you can take as much time on the island as you like. But make a note of the time of the last ferry back. This can be as early as 4 p.m.! The night tours are operated seasonally and normally only Thursdays to Mondays. They depart in the afternoon, earlier in the off-peak season, later in summer, to coincide with the sunset. Note that the tickets for the night tours sell out even further in advance than the regular tickets. So if this is your choice it is even more essential to start planning well ahead of time. Time required: The “official” estimate given is two to three hours, including the ca. 45 minutes' audio tour of the Cellhouse. However, I found this to be too little time. I spent closer to five hours on the island and could have stayed longer, as I only skimmed some of the older military history parts of the exhibitions and didn't partake in all the ranger programmes that would have been available during my visit. Note that neither the “night tours” nor combination tickets with Angel Island allow you that much time on Alcatraz. Combinations with other dark destinations: in general see under San Francisco. The inside of the former USIS facility can be visited by guided tour only. These normally run at 11 a.m., 12:30 and 2 p.m.; only parts of the site can be visited self-guided and independently. There also used to be a Nike missile battery on the south-eastern side of the island, but only traces of the former launch pads can still be seen. Some better preserved ruins are visible of what used to be gun battery emplacements near Point Knox. Furthermore there are several abandoned buildings, such as an old hospital as well as the former Fort McDowell at Quarry Point, now mostly a veritable little ghost town. Most buildings are closed to the public due to their dilapidated state, but there's a visitor centre/military museum in the old guardhouse. There are various hiking trails to explore, bike rental is available and there are also guided tours of the island by “tram” (i.e. those typical little tourist carts). Seasonally there are combination tickets available from the same company that runs the Alcatraz ferries (64.50 USD). However, these do not include the USIS facility, only a one-hour tram tour of the island. And the overall time of the combination tour is 5 ½ hours. This may not be enough for the dedicated dark tourist who wants to do everything in depth. This is why I decided against that option. Unfortunately I did not find the time to make a separate trip to Angel Island on another day, so I cannot report from first-hand experience. But if I make it back to San Francisco one day, Angel Island will be top of my priorities list. There are regular ferries to Angel Island both from San Francisco (Blue & Gold Fleet, Pier 41) and from Tiburon, which is much closer to the island (to the north). Nearby at Fisherman's Wharf, San Francisco, there are a few more attractions that may be of interest to some dark tourists too, especially the submarine and Liberty Ship (see under San Francisco).